The Dream 9 remain in detention, but to continue to fight against detention, deportation, and the division of families and communities, demonstrating the way forward for all of us. At 10:00 a.m. on Monday, July 22, 2013, protesters marched down the small hill in Nogales, Arizona toward the Morley Gate, an official U.S. port-of-entry. Nine young adults who had lived for many years in the United States without authorization were preparing to cross through there from Mexico and petition for humanitarian parole. Their goal was to return home and reunite with their families. Now known as the Dream 9, a few of them had left the United States of their own accord—either to pursue educational opportunities, seek medical treatment, or to join with others who had previously been deported after spending most of their lives living in the United States. Dream 9 march in Nogales, Sonora toward the U.S. port of entry. Credit: Huffington Post. As we protestors made our way toward the gate and across the railroad tracks, a freight train heading south came to a halt in the middle of the march. Discussion of whether the train was a strategic attempt to block the action immediately began as we talked about ways to get around the train, such as climbing under it or walking several blocks west to cross over it using a pedestrian bridge. Those of us cut off from the rest of the group were not discouraged, however, nor were we left behind. In fact, the longer we stood on the corner, the more visible we became, displaying the way in which borders may shift and defer traffic, but not stop it. The pulse of the crowd grew stronger as we arrived at the Morley Gate, knowing that we were practically in direct contact with the Dream 9. The only thing separating us from them was the steel mesh divider of the Morley Gate itself, which separates the United States from Mexico. Upon receiving an update from the organizers that the DREAMers were about to petition for humanitarian parole, we began chanting even louder: “Bring Them Home!” “¡Traíganlos a casa!” “No Papers, No Fear!” “¡Sin Papeles, Sin Miedo!" Many of us began hitting the mesh barrier as well to support the Dream 9’s effort to draw attention to the hypocrisy and contradictions of U.S. immigration policy. We also wanted our message of no more separations to carry through the gate loudly and clearly to the young people on the other side of the international divide. Months prior to this momentous action, families across the country were optimistic when the “Gang of Eight” released their comprehensive immigration reform bill S.744 in the Senate, in April. Would this be a pathway to citizenship for 11 million undocumented people, many wondered, and a chance for millions of families to come out of the shadows and shake off the fear of being separated from their loved ones? 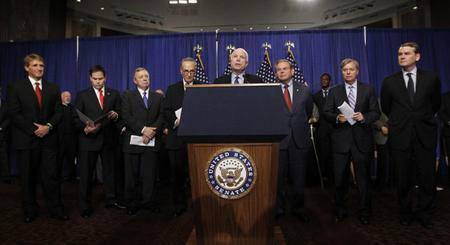 Gang of Eight. Credit: www.zocalopublicsquare.org. A few southern Arizona grassroots organizations, including La Coalición de Derechos Humanos, an immigrant advocacy group in Tucson, were immediately skeptical. With years of experience fighting the criminalization of migrant communities and the militarization of the southern border, Derechos Humanos knew better than to hold their breath for progressive reform to come out of the Obama Administration, which is responsible for over 400,000 deportations per year, the separation of thousands of families, and a highly restrictionist Congress. S. 744 mandated that certain border security “triggers” be met before a single person would be allowed “Registered Provisional Status,” and the “pathway to citizenship” was onerous at best. Still, the bill did not “secure” the border sufficiently to gain enough Republican votes. Thus, the Corker-Hoeven Amendment was introduced and, with President Obama’s support, subsequently passed. Although the bill is highly flawed, DREAMers and agricultural workers would benefit from its passing. People with Dream Act status, for example, would be eligible for permanent residency in five years and then immediately eligible for citizenship. However, for many undocumented immigrant youth, this portion of the bill asked them to compromise their families: offering young people the promise of citizenship, while ensuring that their parents or siblings would endure the constant fear of deportation and family separation. It was in this political context that the Dream 9 took action on Monday, July 22, 2013. Dressed in caps and gowns, the youths crossed one-by-one through the gate and were immediately detained by Customs and Border Protection (CBP). Demonstration in support of Dream 9 outside of Morley Gate in Nogales, Arizona. Credit: Abby Wheatley.This highly public border crossing actively challenged the disciplining nature of militarized policing by bringing the process out of the shadows and into the public eye. With family and community support present, the courageous effort by the Dream 9 underscored the fact that notions of home, citizenship, and belonging are not governed only by institutional powers or the state; they are also generated through community relations, regardless of international boundaries. The Dream 9 are not first and foremost activists. They are family members; they are parents, sons, daughters, brothers, and sisters. For many, this gave us the energy to keep shouting: “Bring Them Home!” even as a line of law enforcement stood between us and them, with weapons ready. It is what compelled us to keep chanting even when we were separated by an unanticipated freight train. It is why they risked incarceration in order to simply be with their families. More than two weeks after this pivotal event, the Dream 9 remain in custody at a CCA-owned detention facility in Eloy, Arizona. Inside the Eloy Detention Center, the youths have continued their brave protest of the inhumane treatment of immigrants by organizing a two-day hunger strike, joined by seventy other women detainees, and leading other inmates in a chant of ¡Sin Papeles! ¡Sin Miedo! Two of the DREAMers, María and Lulu were even placed in solitary confinement for 15 days for their acts of defiance. As of Tuesday, August 6, 2013, although not yet released from detention, they have been granted the ability to petition for asylum before a judge. For those fighting for an end to family separations, hostile immigration policy, and the detention and deportation of community members, this puts more fuel on the fire of resistance. With their communities behind them, the Dream 9 will keep fighting until they are reunited with their families: their parents, grandparents, brothers, and sisters, showing all of us what challenging unjust policies really looks like. Abby Wheatley is a PhD student at the California Institute of Integral Studies in San Francisco and is currently researching the strategies of survival and resistance that Mexican and Central American migrants employ in the face of an increasingly harsh border security apparatus. Cristen Vernon works with La Coalición de Derechos Humanos in Tucson, Arizona where she advocates for immigrant rights and documents abuse of undocumented immigrants.